When Bayliner recently expanded its revolutionary Element line to include two new 21-foot models for 2017, you could have went and bought a lottery ticket on the fact of one of them being a fishing version. 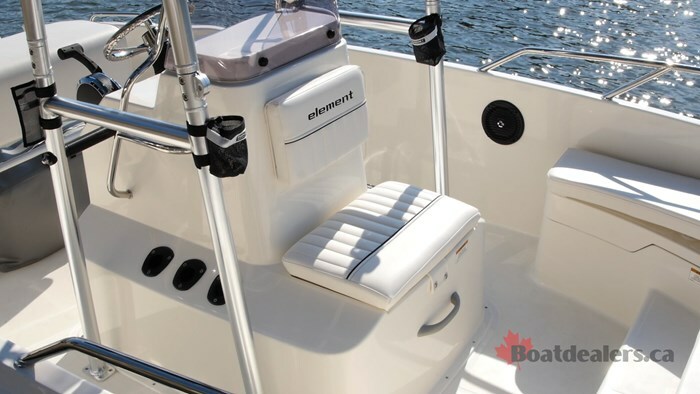 First introduced in 2013 as an affordable way to get people into boating, the Element has since seen a pretty fantastic expansion that first started with a fishing version of the original 16-foot boat. It was then expanded into an 18-foot version of both the original and the fishing. Now for 2017 they have expanded this into a 21 foot version. Whenever a boat builder expands their line, I’m always curious to know where they put the extra space. For this new Element F21 they added to the bow of the boat, giving the F21 the largest bow casting deck of the Element family. This bow deck is covered with a non-skid surface as it most expectedly plans to get wet as you’re hauling your multiple catches in. It features a center anchor locker towards the forward end of the platform and three large lockers that flank the single center step up to the platform. There are a couple of things that I really like about these lockers. The first of which is that they are finished with a white gel coat. 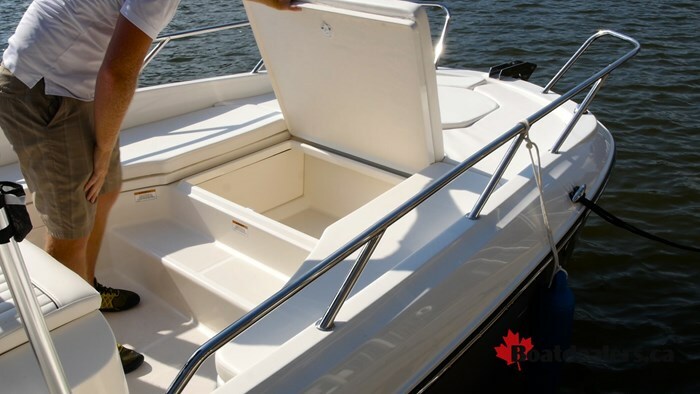 Traditionally Bayliner is not known for finishing the inside of compartments with gel as a means to keep costs down, but by doing so on this new F21 they show their continued dedication to quality and brand image. The second element I like about these lockers is that they freely open with the optional bow cushions installed. Oh ya, you can also get snap in cushions for the bow deck! Since there is so much usable space up there with this expansion, Bayliner knows you’re not going to be fishing 100% of the time so you might as well get the most out of your boat by adding cushions for when you want to hang out. These white vinyl cushions are easy to snap in, stay in place when you’re running and stow easily in one of those large lockers. Rounding off the bow features, almost literally, is a stylish and functional stainless steel railing system, similar to what you would see on larger fishing boats. It doesn’t go all the way around the bow of the F21, instead it keeps the pulpit area open. I like this incase you want to board from up there, but mostly it is kept open so you can mount a trolling motor up there. Additionally when you have the bow cushions in you can lean against the railing and relax. A very simple, yet functional addition. As you move mid-ship you will find the center console, which of course is what makes the F21 what it is. It’s a great size, features a jump seat forward of it, and it’s tall enough that if someone were to sit in that seat they’re not going to be blocking your field of view. It has a mid-height windshield with a stainless grab handle that frames it and plenty of room to mount electronics. The helm portion is ergonomic and comfortable. 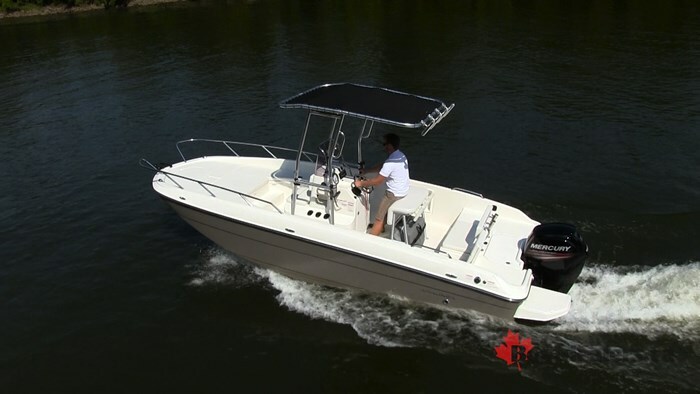 It features a lean-post style seat that you would find, again in larger center console boats, but it’s also still comfortable should you wish to hop up and take a seat for those longer cruises. There’s a decent sized tray to toss loose items and the wheel and controls are in perfect position. This F21 was shown with the optional T-top that is built out of heavy-duty brushed aluminum. It provides exceptional sun coverage, gives you more to hold on to if your guests are standing while running and even has rocket launchers off the top. What would be cool, is if there was helm curtain enclosure option to come in the near future. The F21 is a sizeable enough that if they were to do so it wouldn’t make anyone claustrophobic. There’s 3 rod holders on both the port and starboard bases of the console and the jump seat I mentioned earlier has very deep storage under it. You could easily toss mooring covers or PFD’s (personal floatation device) under there. There is rod storage in each of the gunnels and the freeboard height is quite respectable where you don’t feel like you’re riding in a bass boat. 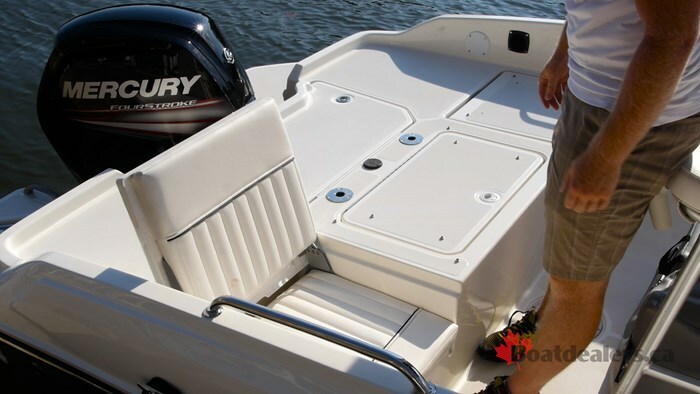 The stern casting platform also features a nonskid surface and large enough that two adults could fish from back there without issue. But what’s better is, much like its smaller siblings, plays double duty as two jump seats fold out of the platform. They fold up with no exposed hinges but are also quite stable to walk on. Those same seats also fold forward to reveal storage. Between these seats you will also find the live-well. In the past, the other two Element F boats were available with a watersports package which included a mini watersports arch that went around the motor and the new F21 is no different. This, again, adds to the versatility of the boat and turns your fishing boat into a fish and ski, which would go along nicely with those jump seats and the bow cushions. 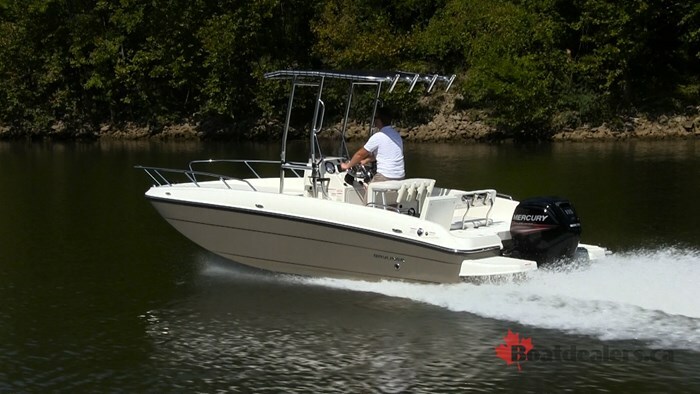 Built on Bayliner’s M-Hull, the F21 comes standard with a 115-hp Mercury Outboard but the one I was able to test came with an optional Command Thrust 115-hp Merc. Usually reserved for pontoons, the Command Thrust gives you a “beefed up” gearcase that gives you lots of low end torque. This was a fine fit for the F21 as it provides smooth acceleration out of the hole and onto plane. The M-Hull experiences very little bow rise when getting on plane, which is a great application for those fishermen who find themselves in shallow waters. It runs smooth and flat with very little draft, making it great for river running. It experiences very little bank in turns which make it great for families and new boaters. I’m starting to wonder if there is anything the Element F21 can’t do? 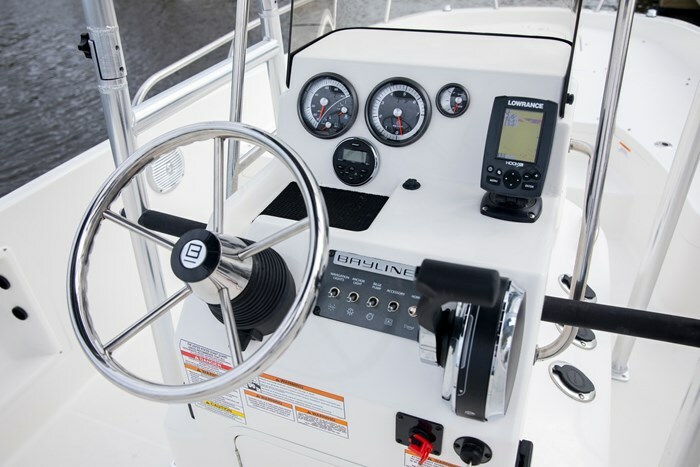 I tested the F21 at the Bayliner Dealer meeting in September, and sometimes companies use these opportunities to test different gauge options. So unfortunately the gauge we had on our test model wasn’t working at the time. But really I wasn’t concerned. I had my questions about how the M-Hull would react to the expansion, since it started out originally as a 16-foot version and my questions were immediately answered. All the characteristics that they built this hull on remained the application was great. Bayliner has built a whole new segment for themselves with their F Series fishing boats. They have always had fish and ski’s but now they have dedicated fishing boats that stay true to their values of getting people out on the water at a great price. Fishing is one of the most popular pastimes, so I predict they’re going to sell a lot of these new F21’s.